Designed as an intensive, hands on workshop that will take participants to all the steps of film making – from story development, script writing, directing, producing, cinematography, sound design and editing. On campus lodging and all meals provided, participants will focus on crafting stories reflective of true people’s lives and molded by their unique sensibilities as they soak up inspiration in the idyllic beach camp. Promoting an open, interactive, and creative atmosphere, faculty includes Cinema Rehiyon curator Gabby Fernandez, Cinemanila best director Teng Mangansakan, Palanca and Urian awardee Arnel Mardoquio, CCP Film head and former Cinemalaya programmer Ed delos Santos Cabanot, and veteran director Peque Gallaga. Days are packed with hands-on practice, lively discussion, and brainstorming – and evening include film screening and interactions, and social events. By the end of the workshop, participants are expected to submit their storyline and production plan. A mentoring scheme will be designed for the participants to ensure artistic guidance as they create their short film projects from June to August 2013. 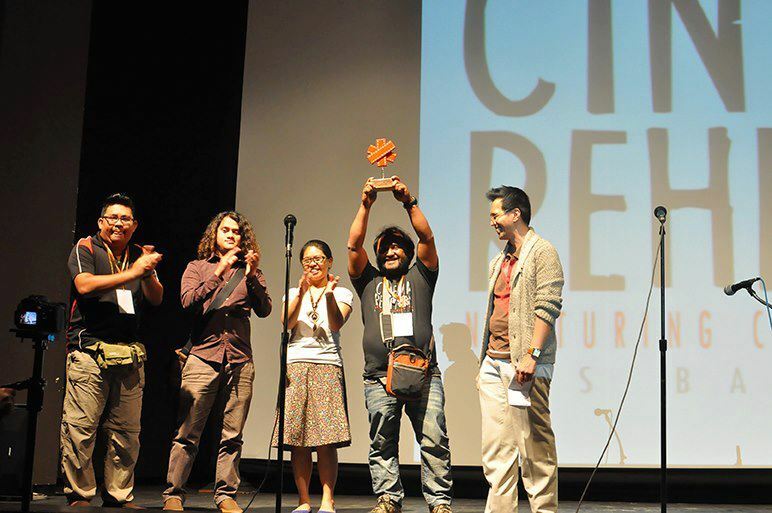 All short films will be presented in the inaugural SalaMindanaw Film Festival in September. Registration fee is P7,000, inclusive of board and lodging, workshop kit, IDs, T-shirts and party passes. 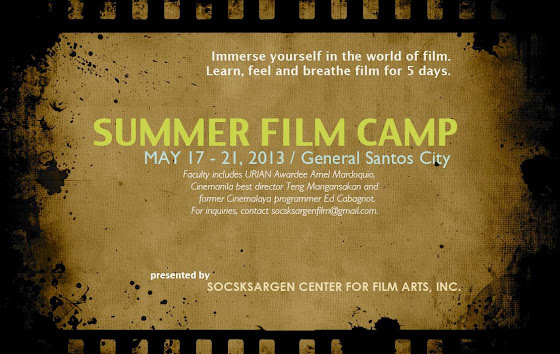 For registration and inquiries, please email: socsksargenfilm@gmail.com or contact +63 922 885 9481 and +63 927 790 2521. Presented by SOCSKSARGEN CENTER FOR FILM ARTS, INC.
SOCSKSARGEN Center for Film Arts, Inc. (SCFA) president Bordie Carrillo raises the insignia of Cinema Rehiyon after NCCA-National Committee on Cinema chair Dr. Miguel Rapatan (far right) announces SOCSKSARGEN's inclusion in the roster of regions with NCCA-affiliate film festivals. Also in the photo are SCFA treasurer Raymond Lopez, SCFA secretary Nino Solis and Cinema Rehiyon 5 festival director Prof. Kei Tan.